Department of Defense Dictionary of Military and Associated Terms, defines psychological operations (PSYOP) as “planned operations to convey selected information and indicators to foreign audiences to influence their emotions, motives, objective reasoning, and ultimately the behavior of foreign governments, organizations, groups, and individuals.” PSYOP has become a mainstay of US government efforts at the strategic, operational, and tactical levels to exert such influence in a manner favorable to military operations. PSYOP played a significant role in recent operations such as Enduring Freedom, in which air-mobility missions delivered humanitarian rations at the same time air-combat sorties struck militarily significant targets in other parts of Afghanistan. Furthermore, during Iraqi Freedom, we dropped both leaflets and ordnance to prompt enemy soldiers to surrender; we also broadcast messages to them over their own radio systems. These transmissions had the complementary effect of denying the Iraqis use of their own radios. The role of Psychological Operations is to alter the behavior of foreign populations in a manner consistent with United States diplomatic, national security and foreign policy objectives. A Psychological Operations Specialist is an information and media specialist who can assess the information needs of a target population and develop and deliver the right message at the right time and place to create the intended result. 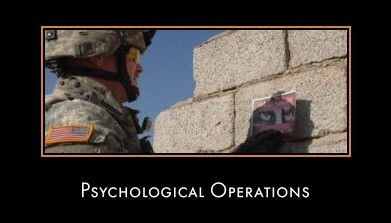 As a member of the Army Special Operations community, the Psychological Operations Specialist is primarily responsible for the analysis, development and distribution of information used for information and psychological effect. Research and analyze methods of influencing foreign population from a variety of information sources. Develop marketing and media products that includes handbills, trifolds, brochures, leaflets, posters, television commercials, web postings and/or radio scripts. Operate and maintain Psychological Operations equipment such as ground tactical vehicles and shelter systems, loudspeaker systems, state of the art computer, analog and digital recording and playback devices and communication systems. Disseminate products that include the development, production and broadcasting of relevant information via television, radio, internet and newspaper media. Travel to overseas locations in peace, crisis and conflict to assist U.S. and foreign governments, militaries and civilian populations. Click Here for further details on psychological operations specialists e.g. training, helpful skills, related civilian jobs etc. 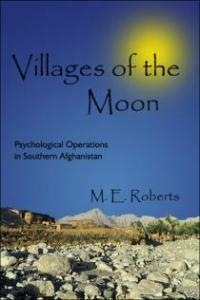 Villages of the Moon" offers a unique perspective into the challenging role of a U.S. Army Psychological Operations team working in Afghanistan after the collapse of the Taliban and Al Qaeda. From tiny firebases scattered along hundreds of desolate miles of "moonlike" territory, PSYOP teams spread information through face to face communication, radios and printed products which were passed out to local civilians. In tandem with Special Forces, far from the security of an American military base, these self-contained, small units traveled the back roads and trails of the Afghan countryside to assess the needs of the people, help influence local leaders and inform people of the tremendous changes coming to their country. This is the story of how those operations were carried out in one small area on a global field of battle. The book consists of the author's Journal, letters and background notes to inform the reader of what PSYOP is and how soldiers live and operate under these harsh conditions.